Asiatime, (2018), ‘Buying ingredients with eating! 'Grocerant' boom in distribution industry, http://www.asiatime.co.kr (accessed on 16. 11. 2018). Choi, J, (2017), The effects of social-face sensitivity on purchasing satisfaction and brand attitude of baseball products consumers, MS Thesis Kyunghee University, Seoul, p53-54. Choi, JB, (2016), How psychological motivation and consumer characteristics affect attitude towards counterfeit products and purchase intention - Focused on moderating effect of similarity to original products and social face sensitivity, MS Thesis Kyungpook University, Daegu, p87-88. Economic review, (2018), Grocery+Restaurant ‘Grocerant’ generation, http://www.econovill.com (accessed on 7. 10. 2018). Hankyungdotkom, (2014), Economic terms, http://dic.hankyung.com (accessed on 29. 12. 2014). Hyun, SH, Lee, KH, Hwang, JS, (2014), The effects of other customer perceptions on brand prestige in the context of convention center: The moderating role of face consciousness, Korean J Tourism Research, 38(7), p143-169. Jeong, IU, (2017), The effect of grocerant’s physical environment on the brand image and behavioral intention, MS Thesis Kyonggi University, Seoul, p1-2. Keller, KL, (1998), Strategic Brand Management: Building, Measuring and Managing Brand Equity, NJ: Prentice-Hall. 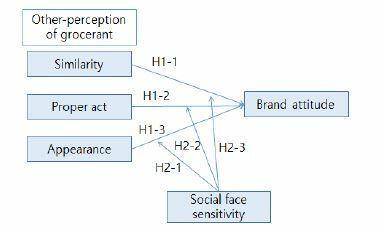 Kil, HN, (2012), The effect of ‘Masstige brand relationship quality’ on brand charisma and brand royalty: Focusing the control effects of face-sensitivity, MS Thesis Kyongbuk University, Daegu, p78-79. Kim, CS, Kim, CW, Yoon, HJ, (2016), The structural relationship among the brand attitude, image, revisit intention, and customer citizenship behavior in glamping customers, Tourism & Leisure Research, 28(11), p401-417. Kim, TH, Yoo, HJ, Lee, IO, (2010), Evaluation of how the motivation the use of specialized coffee branches brand attitude, satisfaction and loyalty, J East Asian Soc Dietary Life, 20(1), p149-158. Kwan, YJ, (2018), The effect of awareness for multi-cultural family on social competence: The mediating effect of social self-concept and the moderating effect of self-identity, focused on multi-cultural family’s adolescents, Doctoral Dissertation Sunmoon University, Chungcheongnam-do, p47-48. Lee, SH, (2017), The structural relationships between social face sensitivity, impression management behaviors, job stress and job performance of hotel service encounter employees, The Academy of Customer Satisfaction Management, 19(1), p149-173. Lee, SH, Lim, YD, (2014), Affect the validity of hotel employees social face sensitivity and fear of negative evaluation on the relationship, Journal of Foodservice Management Society of Korea, 17(1), p177-200. Lim, SH, (2017), The impact of experiential elements of “Grocerant” on customer satisfaction, brand attachment, MS Thesis Yonsei University, Seoul, p4-5. Song, JJ, (2009), Analysis Method of Statistics for SPSS/AMOS, 21Centurybooks, Korea, p187-188. Wang, C, Lee, SJ, (2016), The structural relationship among Korean celebrity endorser’s characteristics, Chinese consumers’ advertising attitude, brand attitude, and purchase intention: Focused on product involvement, Global Business Administration Review, 13(3), p83-102.